In the 1950s 35mm mobile soundfilm recording equipment was bulky and heavy and needed to be installed in a large van. 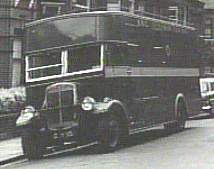 The BBC had two such mobile recording units, one for 35mm optical and the other for 35mm magnetic recording. With such physical restrictions, apart from "talking heads" which obviously required lip sync, almost all film was shot silent, and sound effects (fx) and music were added in the Dubbing Theatre from BBC discs and mood music discs. When the Producer and Editor of the film programme (which could be a complete programme on film or a series of studio inserts for a live programme) had arrived in the Dubbing Theatre, the projection crew upstairs would load the cutting print of the film plus any soundtracks there might be. The projector, recorder and any separate filmsound reproducers were all driven in sync with Selsyn motors. If we were lucky, the film editor would have prepared cue sheets for us which indicated the exact places a particular sound effect or music had to occur. But quite often the editor had not done this, in which case we would have to make our own while watching the film on its first rehearsal and/or while the commentary (if any) was recorded. In the commercial film world, a dubbing or re-recording theatre was built like a small cinema, with the mixing console towards the rear of the auditorium while the picture was projected onto a cinema-size screen at the far end. This approximately replicated the viewing conditions in a typical cinema. For television the thinking was that a programme would be viewed in the home, under domestic conditions and so the layout of a tv dubbing theatre was different. 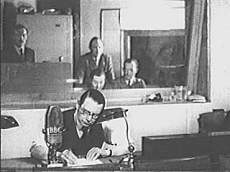 Here the mixing console was in a room behind the auditorium, viewing the screen through a large double-glazed window, rather like a radio studio, while the commentator sat in front of the microphone at a table in the auditorium, with the editor cueing him by his side. Thus the mixer in the room behind, heard the sound under conditions more of a domestic nature. Next to the mixing console were banks of 78rpm disc players from which the person on "Grams" would play-in the many fx and music discs as required. 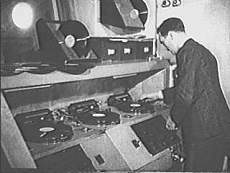 The original dubbing theatre at AP had four turntables, but at Lime Grove and Riverside there were six. In television, film was run at 25fps (frames per second) in contrast to the cinema standard of 24fps. Films on 35mm were recorded in reels of up to 1,000ft which, at 25fps lasted up to 10mins.There was a footage counter visible under the screen which indicated feet of film, the beginning of the picture starting, naturally, at 000ft. In actual practice, every reel of film would have a leader on the front, with the START frame 15 feet from the beginning of picture, thus the footage counter was set at 985, and thus everything ran up to speed with the start of picture appearing at 000. If we had no cue sheet, the person on Grams would watch the film on rehearsal and note down the footage at which various sounds should occur. If, for example, a car door was shut at footage 268, this was noted on the cue sheet. The appropriate fx disc of a car door shutting would be taken from the library of discs next to Grams, and cued up using headphones ("cans"). The precise point of the sound would be heard in the cans and the disc moved in reverse by exactly one revolution and stopped there with the pick-up on the disc. On a further rehearsal or a "take" when the number 267 came, the disc would be spun sharply and thus at 268 the car door fx would happen, in sync with the picture! With other things happening together, for example background atmosphere, footsteps, traffic etc would be playing from other discs, it could get quite involved and the grams operator could have piles of discs ready above each turntable. It was, however, important that cue sheets were not marked in red, as, when the lights were dimmed while recording, this left a low-level red light on, so any red marks on white paper tended to become invisible! If, during a take, a mistake occurred some way into the reel, for example after 5 minutes, instead of wasting the good part of the mix, the defective recording would be taken upstairs to projection and run as an additional track, the dubbing mixer fading over to Grams just before the mistake and the rest of the reel recorded. In a similar way if the mix was complicated, parts of the sound would be recorded as a "pre-mix" and then used, the missing sounds added on the next run. With regard to music, if the editor had not laid any music tracks, music, too, would have to come from discs. The start of music, say, for the opening titles, was easy enough to do, as in the car door example. But for end titles where the music and titles have to end together, one had to "back-time" the music, noting how long it lasted from a particular part of the music to its end, in seconds, then converting this to film footage. Subtracting this number from the end footage of the film and then cueing the disc at that footage number made the music end at the right place. In the 1950s television films were dubbed this way and a high degree of skill on the part of both the mixer and Grams operator produced professional results in a minimum of time.